I love seeing stands of cattails swaying in the breeze on a summer day. Later in the season, when the spikes burst open, their fluffy insides makes me want to stuff pillows. A Quebec company is already using milkweed fluff as insulation in jackets, so I have no doubt that at some point, an enterprising clothing manufacturer will press gang cattail fluff into similar service. 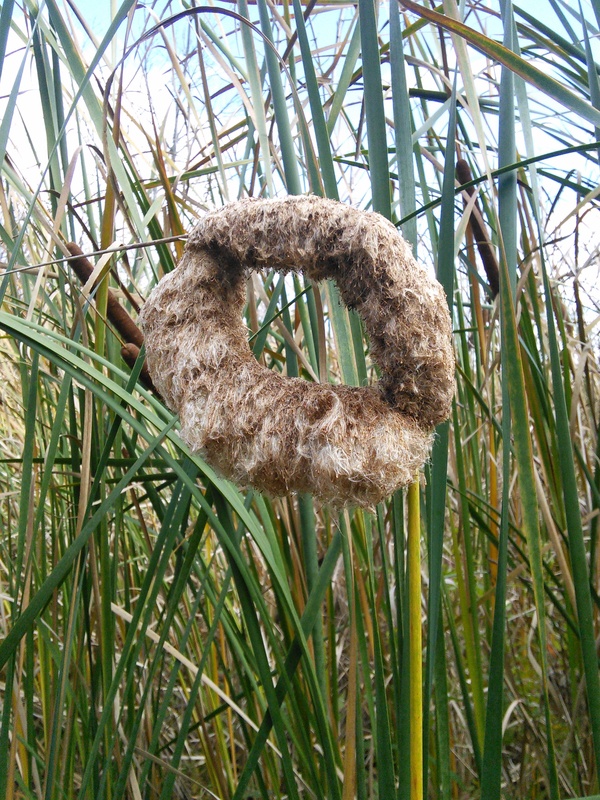 Cattail spikes have both male and female reproductive parts; once the male on top pollinates the female below, it shrivels up, leaving the female to turn into the familiar chocolate brown sausage-looking spike. 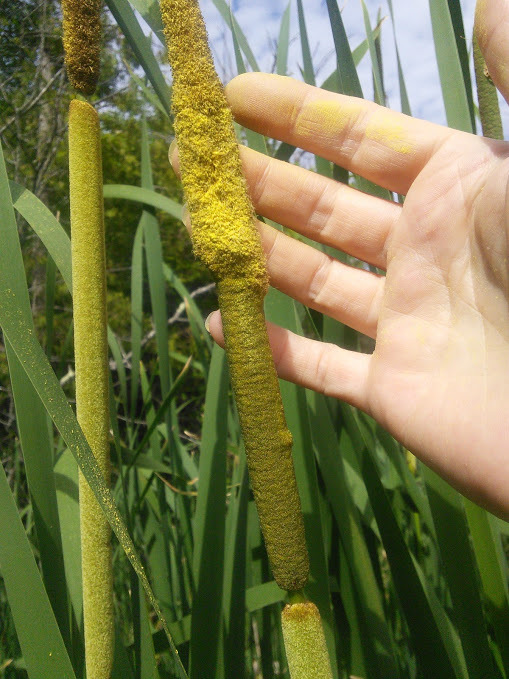 I had been meaning to try cattail pollen for a few years now—I’d read many articles and recipes about how to use it as a flour, particularly in pancakes—but I either couldn’t get to a good stand of cattails in time to get at the pollen, or rain conspired against me. This year, however, I was determined to get some. Male spike starting to release its pollen; female spike is right below it at the bottom of the photo. I found a nice stand in a marsh alongside the Ottawa River and set to work. Collecting it was relatively easy and I didn’t have to cut the plant or dig it out. Once I found a pollinating male spike (bright yellow), I gently bent the whole cattail reed toward me, inserted the spike into a bag, closed it around the base of the spike, then shook the spike lightly against the inside of the bag to release the pollen. I then released the cattail back to its rightful place. My hands were soon covered in bright yellow pollen. The day I went out, many of the male spikes weren’t ripe enough but I did manage to get about a half cup of pollen, enough for at least one experiment. I dumped the pollen into a bowl and removed a few bugs that had made the journey home with me (including one very pollen-covered spider, which I released into my back yard). I figured there might still be a few small insects hiding in there, so I chucked the bowl of pollen into the freezer for an hour. I was going to cook it anyway, so any stray bugs would just be extra protein. Mix 1/4 cup cattail pollen, 1/3 cup chickpea flour, 1/2 cup flour. Add 1 beaten egg. Add beer. I used about half to three-quarters of a tall boy of lager to get the right consistency; too runny and it won’t stick; too thick and all you’ll taste is batter. If you don’t have chickpea flour, increase the amount of whatever regular flour you use. This recipe made enough batter to coat fish to feed 2-3 people. Note: I cook by eye and by tasting as I go, so these are approximate amounts. Now, what to make? 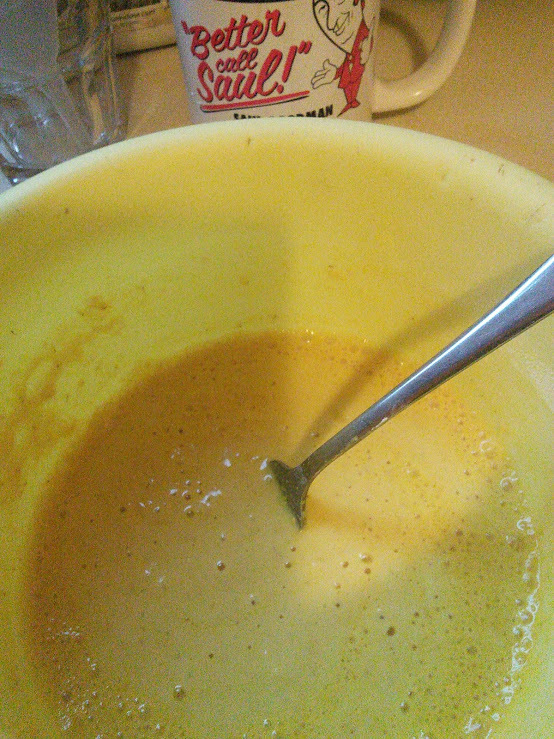 I didn’t have enough to make pancakes so I decided to make a beer batter instead. I had some Boston bluefish, so I cut up a large filet into four smaller pieces, dipped each piece into the batter, then fried them in bacon fat. The batter was a brilliant yellow colour and turned a lovely golden orange once it was cooked. My apologies, but I was enjoying the fish so much that I forgot to take a photo of the finished product, so you’ll just have to trust me that it was delicious! Cattails aren’t just good to eat, they’re also an important natural water purifier. Cattails can absorb many elements that can harm natural water bodies, such as too much nitrogen or phosphorous; they’ve even been used to remove arsenic, and some municipalities in Canada have also used them as part of their wastewater treatment systems. Disclaimer: Like many plants, cattails can grow just as easily in polluted water as in clean water, so ensure that you have a clean supply. If you plan to start foraging, do your research. It is your responsibility to correctly identify plants for consumption. Anyone can have an allergic reaction to any plant, so do your due diligence. If in doubt, don’t put it in your mouth!